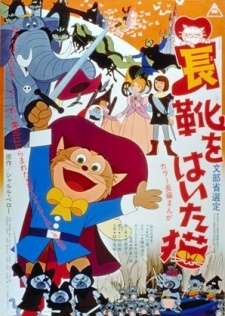 A comic adaptation of Charles Perrault's classic fairy tale about a clever musketeer feline in boots. His goal is to help the weak and defenseless, but his saving a mouse makes him the most wanted in all Catdom. On the run from the notorious Three Blunderers, Perro befriends a young miller's boy, Pierre, and together, they decide to seek their fame and fortune. When they cross paths with the lovely Princess Rosa, Perro determines to get Pierre hitched to Her Royal Highness. But the wicked ogre, Lucifer, also has his sights on Rosa. Nonetheless, with the help of a band of comic mice thieves, Perro manages to get Pierre to become engaged to Rosa. But on the night of the full moon, Lucifer kidnaps the princess, and Pierre, Perro, and the mice bandits set off to rescue her.